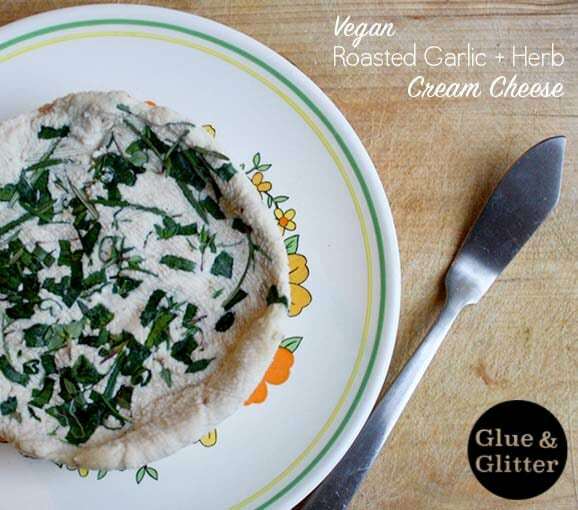 This vegan cream cheese recipe is simple to make and much healthier than conventional or even other vegan cream cheeses. 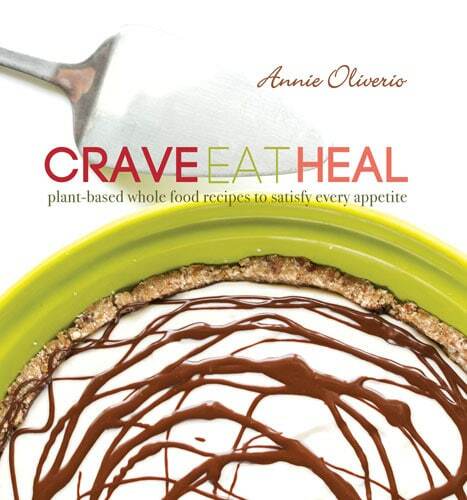 I am so delighted to be sharing a recipe from Annie Oliverio’s new book Crave, Eat, Heal. Annie is one of my favorite food bloggers and food photographers. This book is extra special to me because not only do I love Ann, but I contributed a recipe to the book. My Gingered Coconut Sweet Potato Soup is in the warm cravings section. All of the recipes are vegan, free of refined sugar, and contain little to no oil. Every recipe proves that you can satisfy any craving without hurting animals and while supporting your own health. And the book is gorgeous! Crave, Eat, Heal is available for pre-order now, and it officially releases on May 4th. A low-oil, vegan cream cheese might sound kind of impossible, but this recipe – written by Annie and tested by Diana from Veggie Next Door – uses cashews and coconut to achieve a rich, creamy texture. 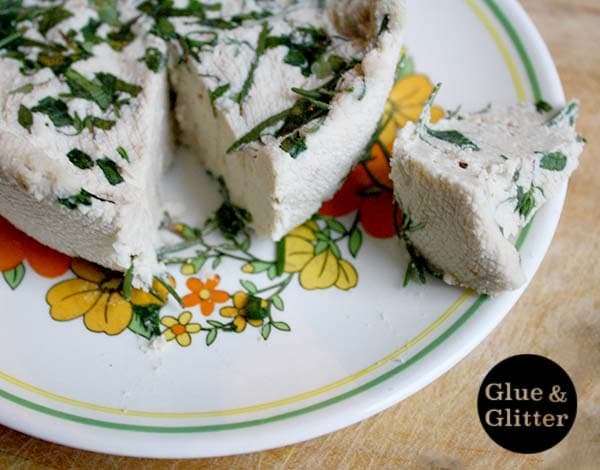 This vegan cream cheese recipe does have a slight coconut flavor. If you’re not mad about coconut, I’d suggest using 1/4 cup more cashews in place of the coconut flakes. I am a coconut fan and really liked the way the lemon, coconut, and garlic flavors melded in this recipe. Even before pressing, the resulting cream cheese was thick and spreadable. You could totally skip the overnight pressing in a pinch, though the extra time does yield a more cream cheesy texture. Notes: I don’t have ramekins, so instead of making two cream cheeses, I put the whole shebang into a two cup glass bowl and set a big mason jar full of water on top to press. The directions below are the original, but if you want to make one block, that’s worked out fine for me. The instructions below also call for a food processor. I used my Vitamix. If you want super creamy results, I’d definitely recommend a high speed blender. Preheat toaster oven (or oven) to 450-degrees. Cut off the top 1/3 or so of the garlic and wrap the head in foil. Place the garlic in the oven and roast for 30-45 minutes, or until fragrant and very soft. Remove from the oven and allow to cool completely before unwrapping. Line two 3/4 cup ramekins with cheesecloth. Sprinkle the bottoms of the ramekins with one tablespoon each of the herbs, reserving the remaining herbs. Divide the mixture between the prepared ramekins, pressing the cheese down into the herbs and cheesecloth. Tap the ramekins on the counter a few times and level the top. Divide the remaining herbs between the two ramekins, gently press them into the cheese and cover with the ends of the cheesecloth. Put one ramekin on top of the other and fill a third ramekin with water and place it on top of both ramekins (you’ll have a “tower” of 3 ramekins). Place them in the refrigerator and let set overnight. The next day, remove the water-filled ramekin. Gently tug the cheesecloth to remove the cream cheese from the other ramekins and serve with bread or crackers – or place them in an air-tight container for up to one week. I’m not a cream cheese fan but I think my husband and kids may enjoy. They love to eat cream cheese! Dividing recipes by cravings is so neat! It’s fun to make. Popping it out the next day feels so satisfying! Does it taste like coconut? I am not a big fan of the taste but sometimes when you use with other products, you can’t taste it as much. It does, a bit. I think you could use maybe an extra 1/4 cup cashews in place of the coconut. That looks so good Becky. I am going to step outside of my comfort zone and make it! Hurrah! You will not be sorry. I can’t wait to make it again! I’d recommend definitely using the green onions in your herb mix. They’re so nice with the garlic. Love this! I am looking forward to following along with the tour! Thank you! It’s an awesome book. So happy to be a part of it. It was super delicious, Emma! My two year old liked it so much. Ooh thank you for letting me know, Poppy! I will fix that as soon as I’m back at my computer!